Description: CSS&SB 1 and 28 at Burnham, Illinois, sometime in April 1975, Ektachrome by Chuck Zeiler. I did not keep careful notes on this trip, so please feel free to add/correct any information. Number 1 is on a Central Electric Railfans' Association sponsored fan trip from Chicago to (I believe) Michigan City and return, featuring sequential cars 1, 2, 3, and 4. 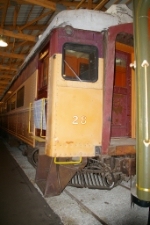 Number 28 is on the rear of a regularly scheduled train. 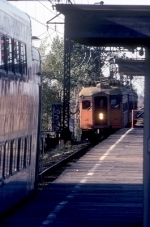 Description: The trains are southbound on the local side of the platform. Description: CSS&SB Standard Steel 28 at about South Water Street in Chicago on an unknown day in August 1978, Ektachrome by Chuck Zeiler. Description: CSS&SB Standard Steel 28 at about Roosevelt Road in Chicago on an unknown day in August 1978, Ektachrome by Chuck Zeiler. Description: Old photo scan: South Shore Line coach on display in Barn 6.